This symposium will be held in Nonnweiler from 7th - 9th November 2019. For details and more information please look at the folders "Announcement/Registration" and "Itinerary". Further information on the publication of the abstracts can be found in the subfolder " Publication of the abstract volume, submission of the abstracts". The organizers want to understand the mistletoe symposia as an integrative element in oncology. 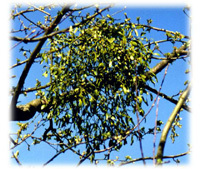 More than half of all tumor patients in German-speaking countries use mistletoe preparations as part of their therapy on the basis of medical prescriptions. Therefore, it is important to get to know the therapeutic possibilities of this medicinal plant and its ingredients even better and thus make it usable for the patients and their tumor therapy. The aim is to build bridges between therapeutic directions, between pharmacy and medicine, between basic research and application, and especially between conventional and complementary oncology. Therefore, the mistletoe symposia are organized by numerous medical and pharmaceutical societies together with the Karl and Veronica Carstens Foundation (see announcement). In addition, the aim is for scientific societies and representatives of complementary as well as conventional oncology to deal with questions and studies on the safe and reliable use of mistletoe in tumor therapy within the context of mistletoe symposia.